Every summer, millions of children attend summer camps throughout the United States. They develop a sense of independence as they try new adventures away from home. 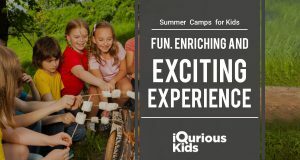 Not just this, but Summer Camps with iQuriousKids is a special type of community where kids come together to have fun and learn creative and exciting stuff. Within the camp setting, they learn new skills, gain self-confidence and become a part of our ever growing community. All different types of children thrive in a camp setting and there is no specific age that is ideal for starting camp. All you need to do is, understanding your goals for the camp experience which will help you narrow down the type of camp that is best for your child, and contact us. Trust us, we will take care of the rest.